Four months after the iPhone maker breached the $1 trillion mark. 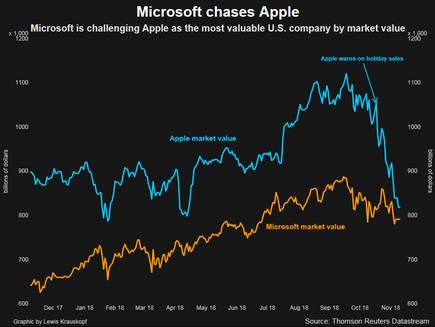 Apple has all but lost its lead as Wall Street's most valuable company and is on the verge of being replaced by Microsoft just four months after the iPhone maker breached the $1 trillion mark. Buoyed by a broad rebound in US stocks on Monday, Microsoft jumped 3.11 per cent to US$106.28, pushing its market capitalisation up to a record US$816 billion at mid-day. At the same time, shares of Apple rose 0.63 per cent, leaving its stock market value at US$823 billion. Earlier, Apple's stock fell, and both companies' market capitalisation were within about US$3 billion of each other, putting them at virtually the same value. But Apple has suffered more than other Silicon Valley stalwarts, down 23 per cent since it warned on 1 November that sales for the crucial holiday quarter would likely miss Wall Street expectations. Apple's market capitalisation overtook Microsoft's in 2010 as the maker of Windows software struggled with slow demand for personal computers, due in part to the explosion of smartphones driven by the iPhone.